As a Jesuit, Catholic university, Loyola is dedicated to helping students grow personally, academically, physically, and spiritually. That’s why one of Loyola’s core values is a focus on the whole person. Engaging spirituality is the norm on Loyola’s campus—and it doesn’t matter what your faith is. You are encouraged to join us on your own spiritual journey. Faith is as important and as central to the student experience as each student wants it to be. Faith is as important and as central to the student experience as each student wants it to be. 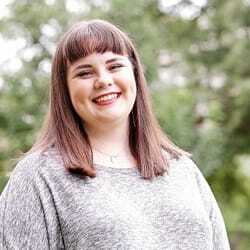 Some students participate in a variety of worship and engagement opportunities each week and each month, while others participate once or twice a semester or not at all. There are levels of participation available; all one has to do is seek them out. That’s the beauty of Loyola: The Jesuit community here recognizes the importance of encouraging students to explore their faith or spirituality at their own pace. You will never be forced to engage in something if you are not comfortable doing so. Alumni Memorial Chapel, built in on the west side of Loyola’s Quad, dominates the skyline. This beautiful building is the venue for many community events and concerts, and generally a nice place to stop and enjoy a moment of quiet reflection. Below the chapel is the office of Campus Ministry. Campus Ministry encourages students to become a part of a community that promotes exploring faith through reflection, discernment, and justice in your daily life. Campus Min organizes and sponsors a variety of faith- and spirituality-based programs and events on campus. Besides a variety of daily and Sunday Mass, the Campus Ministry staff also offers a number of diverse worship opportunities. During the semester, Campus Ministry sponsors Adoration on a monthly basis and Evensong on a weekly basis. Evensong is a prayer service that happens in the Chapel. 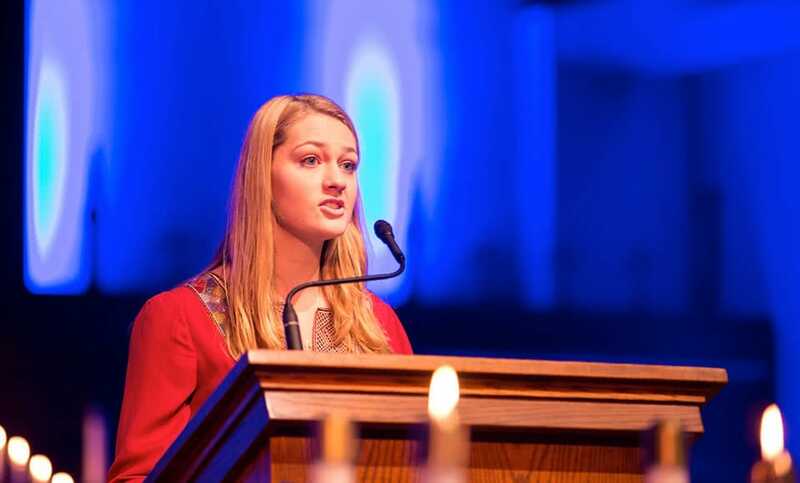 Each week a Loyola student offers a reflection about their faith or spiritual journey. The Music Ministry team assists the service, meeting with the presider to choose music and reading that will aid their reflection and create a peaceful and reflective mood for the evening. Evensong is a good chance to relax and reflect as the week draws to an end. Plus, there’s always free pizza offered afterwards—a nice way to reconnect with friends and enjoy a free meal! Campus Ministry is committed to making sure that students of all faith backgrounds have the spaces and opportunities to worship they seek. While Loyola is a university in the Jesuit, Catholic tradition, and therefore holds weekly and daily Catholic Mass, Campus Ministry is committed to making sure that students of all faith backgrounds have the spaces and opportunities to worship they seek. 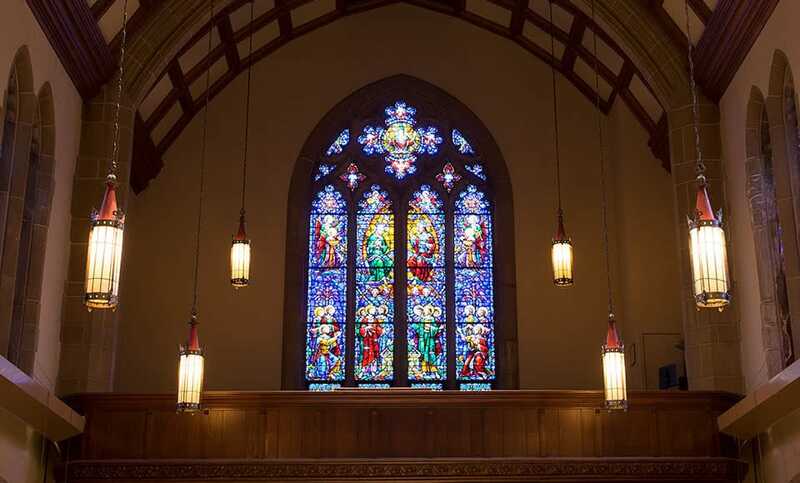 There are a variety of places of worship near Loyola for students with diverse faith traditions, including Baptist, Buddhist, Orthodox traditions, Hindu, Islam, Judaism, Presbyterian, and Methodist. Loyola recognizes that not all students identify as Catholic, and honors the faith of all community members on campus by providing resources about where they can worship as they are accustomed. 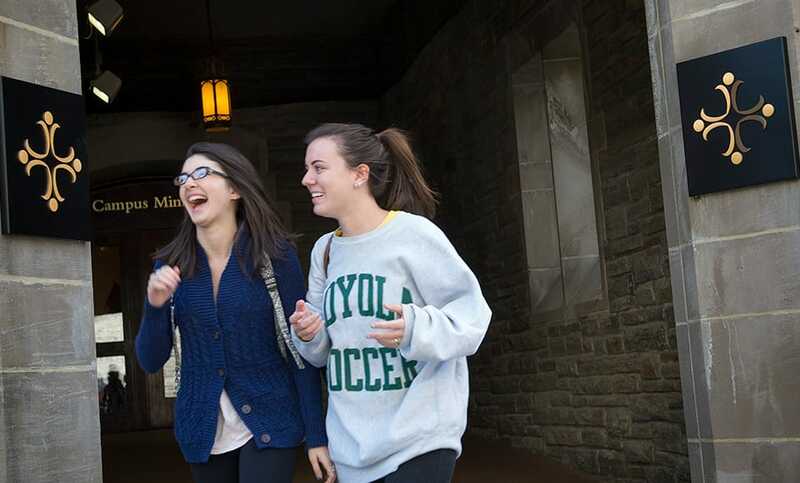 No matter how a student self identifies, Loyola hopes to encourage spiritual and personal exploration and active engagement to the extent that each student feels comfortable. 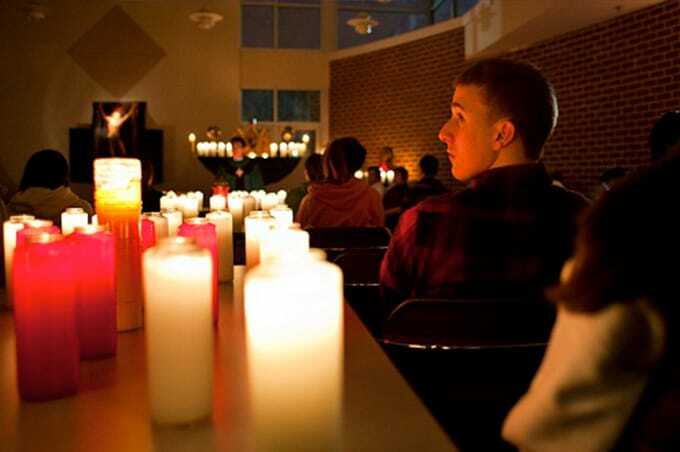 Beyond organized worship on campus, Campus Ministry also organizes a variety of retreats at Loyola’s retreat center. Retreats take place during the weekends throughout the academic year. Retreats are led by a team of students who have planned and prepared for the retreat during the semester. There are opportunities for small and large group reflections, prayer, reflection, and alone time, which can be hard to find on campus. 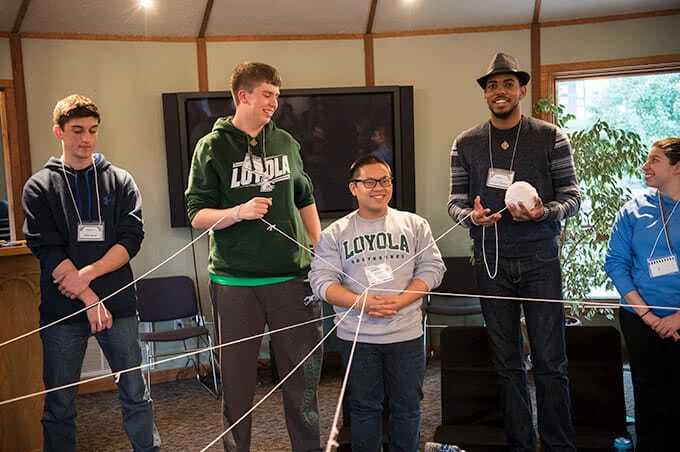 Some examples of Loyola retreats include Men’s retreat, Kairos, and Ignite retreat (an introduction to the Jesuit Identity). Besides reflection and prayer, retreats offer time to get to know other participants over home-cooked meals and free time during the day and in the evening. 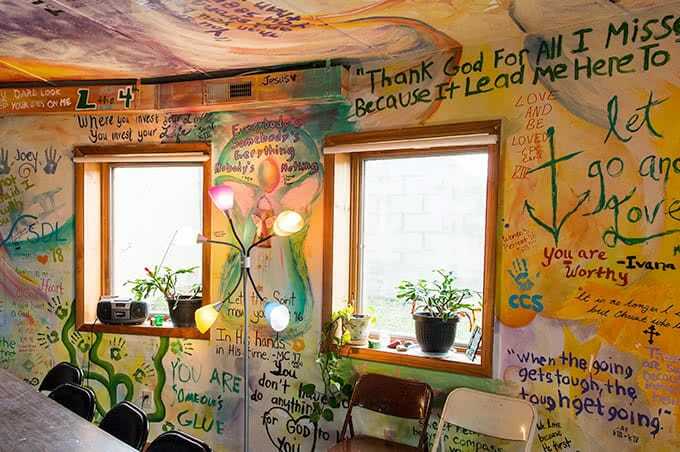 There are plenty of things to do on retreat during free time, including crafting or painting in the art room, playing games with friends, roasting marshmallows, or hiking in the woods near the retreat house. Retreats are a good chance to find some peace and quiet that is often hard to come by in the residence halls, to find relief from the stress of academics and studies, to reconnect with old friends and make some new ones. You only have to do and share as much as you would like, so it’s really a relaxing experience. 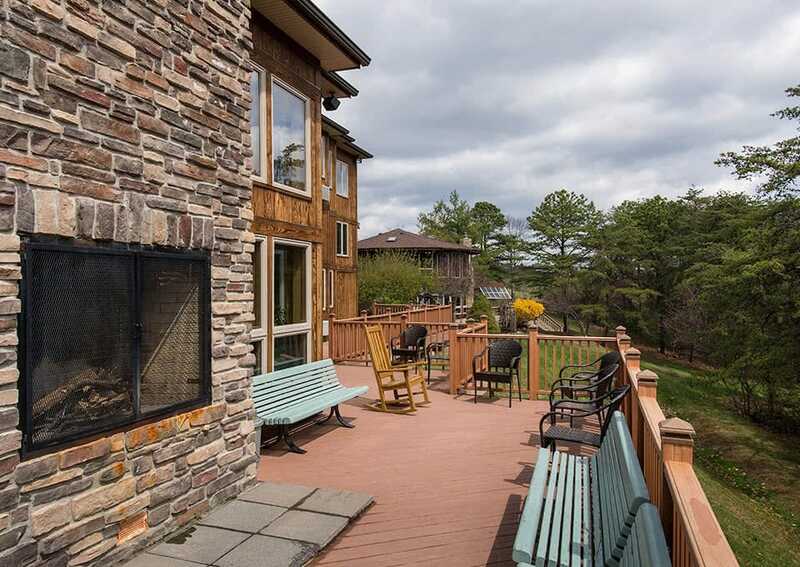 Plus, the views from the retreat house are amazing—you’re guaranteed a good view of the mountains before you return to Baltimore City. 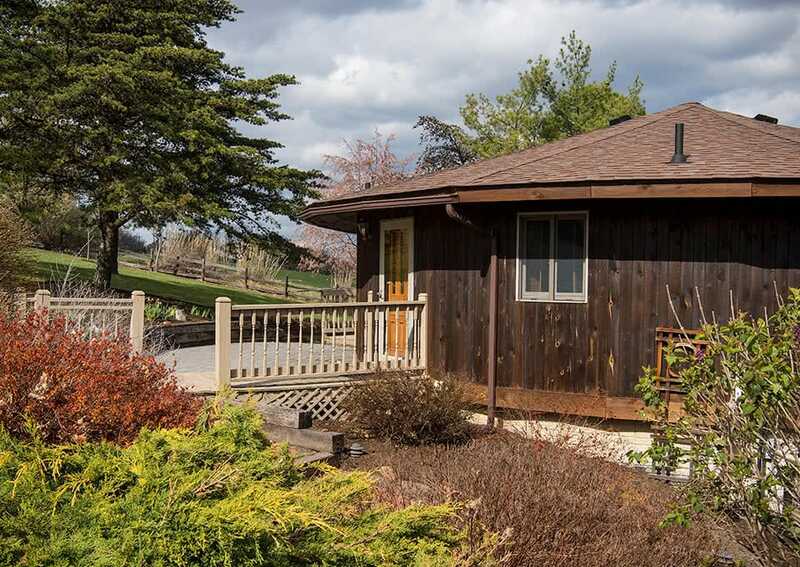 Loyola owns a gorgeous retreat house in the mountains of Western Maryland that overlooks a wooded valley. It’s especially beautiful during autumn, but I’ve never had a bad view from the porch. What they don’t tell you: Retreats always offer amazing food. The bonds you are likely to leave a retreat weekend with are some of the most meaningful you’ll have in college. 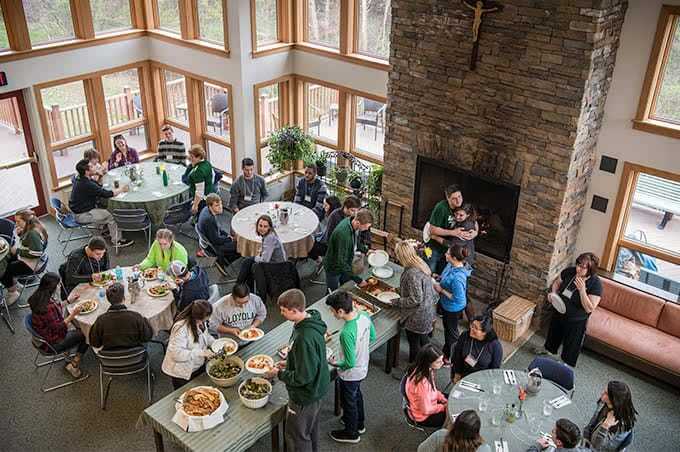 Like Mass, retreats offer a chance to be among peers and explore your faith in a new way, to have meaningful conversations, and to clear your head for a few days and come back to campus refreshed and inspired. On campus, Campus Min offers small group reflection opportunities in the form of Koinonia. Koinonia groups are student-led small faith-based discussion groups that meet weekly to share food, prayer, and discussion about various topics. Each group has between 5 and 10 members and is a chance for students to meet new people, form a community, and challenge themselves intellectually and spiritually. Koinonia groups also meet throughout the year for large-group events, which allow for a larger community to grow between the groups. Anyone is welcome to join a Koinonia group at any point in the semester, based on availability. Loyola InterVarsity, Loyola’s chapter of InterVarsity Christian Fellowship, is non-denominational group that welcomes people of all faith backgrounds. LIV offers Bible Study, Prime Time large group fellowship meetings, opportunities for prayer, retreats for members, and group events. They send their leaders and interested members to IV’s national retreats and conferences, including to IV’s Chapter Camp each May. This group welcomes all to develop and grow in their spirituality, whatever that means to you. The Loyola community further encourages and supports the idea of pro-existence-that is, to do more than coexist with others of different faith backgrounds. Interfaith at Loyola encourages and celebrates our intention to respect and promote one another’s identify, to recognize our shared values, and to work together for a just and humane world. 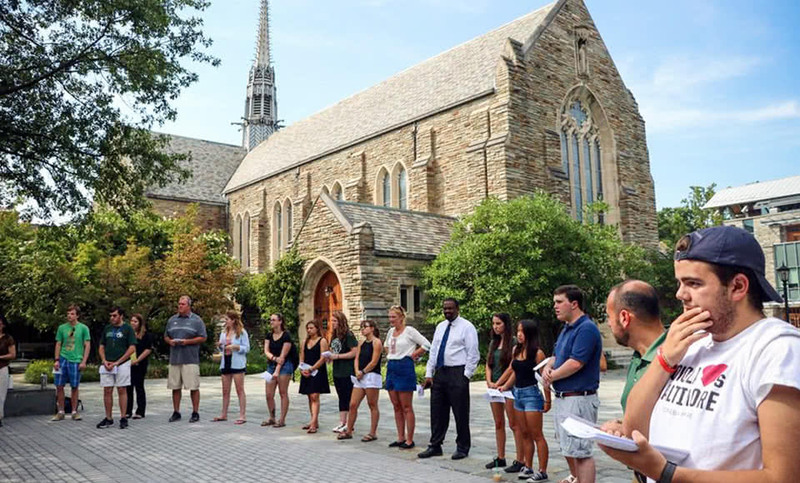 Fava Chapel is a space on campus for Interfaith prayer. 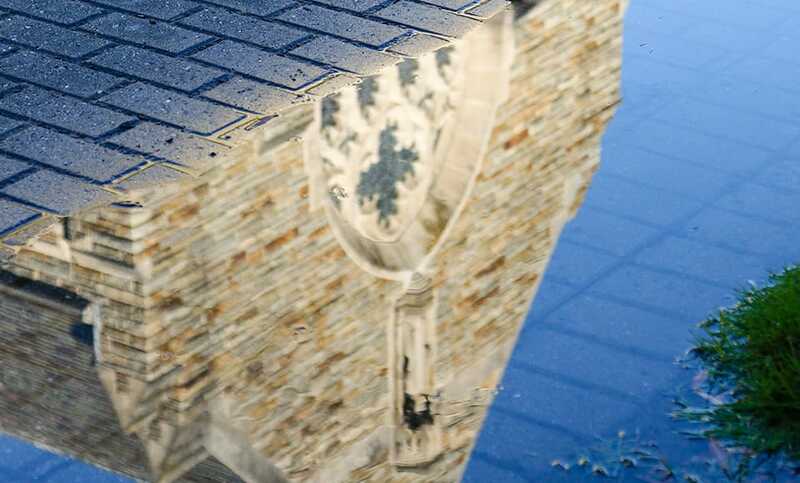 If you are interested in learning more about faith and Campus Ministry at Loyola and in the surrounding Baltimore community, feel free to contact the office of Campus Ministry. They will be able to help answer any questions that you have and point you towards more resources, if necessary.